Ready to track how far along a client is in a package of coaching sessions? Want to show clients in a productized manner exactly what you do and what it is like to work with you? Sounds like the job for Engagements! If you’re curious why we created Engagements, and more about its purpose, check out this post. Here, we’ll get into the nitty-gritty of how to set them up. First things first: make sure Engagements is enabled on your account. There’s no extra charge for this; the option to enable or disable it exists because if you know you DON’T ever want to use it, you can have a slightly more streamlined system by turning it off. To make sure it’s enabled for your account, click on your name in the upper right >> My Account >> Add Ons. When it’s enabled, you’ll find the place to set things up in Settings >> Engagements. Whether you’re just starting out as a single coach or run a large team of coaches, you probably sell a few, maybe two or three, standard products or packages. If you’d like a tidy productization of those, where a client asks, “What exactly do you do? What’s included? What’s it like to work with you?” and you can respond with a direct answer, we think Engagements helps solve that problem. Engagements is intended to make the business side of your coaching business more automated and trackable. 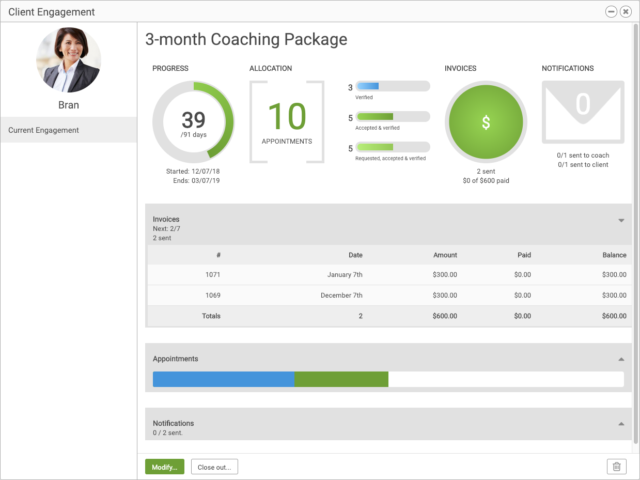 Engagements allows you to keep track of the rules and progress of a given coaching product or package.